The last time national unemployment clocked in at 7.7 percent was in December 2008, before Barack Obama was president. 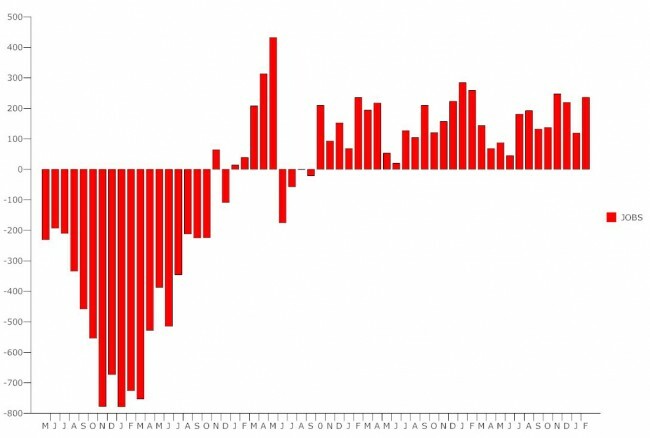 It did so again in February as the economy added 236,000 jobs, totaling just over 1 million jobs in the last six months. In January, the rate had edged up to 7.9 percent. Most sectors gained, including construction and manufacturing, pointing to a more solid recovery in the housing market and boding well for Florida’s economy in the longer term. Some 12 million Americans remain out of work, not counting those who have quit looking altogether or the 8 million people working part-time because they can’t find full-time work. But the so-called U-6 unemployment rate, which more accurately reflects the overall employment picture by including the under-employed, has also edged down to 14.3 percent, the lowest level since a 14.2 percent rate in January 2009. The number of long-term unemployed remains roughly unchanged at 4.8 million. The employment-population ratio held at a still-low 58.6 percent in February, while the labor force participation rate remained at 63.5 percent. The participation rate must be higher if the economy is to show that workers are earnestly returning to the labor force in numbers approximating those before the Great Recession. Still, as baby boomers retire, and absent an influx of younger immigrants, the labor-force participation rate will naturally trend lower than it had in the 1990s and 2000s, because the nation’s fertility rate has also plummeted. between residential (17,000 jobs) and nonresidential specialty trade contractors (15,000). Nonresidential building construction also added 6,000 jobs. The health care industry continued to add jobs in February, with 32,000, as did the information industry (20,000), with a large job gain in the motion picture and sound recording industry. Employment continued to trend up in retail (24,000), totaling 252,000 jobs in the last 12 months. Employment in other major industries showed little change over the month. In February, the average workweek for all employees on private payrolls edged up by 0.1 hour to 34.5 hours. The manufacturing workweek rose by 0.2 hour to 40.9 hours, and factory overtime edged up by 0.1 hour to 3.4 hours. Average hourly earnings for all employees on private payrolls rose by 4 cents to $23.82. Over the year, average hourly earnings have risen by 2.1 percent–not enough to overcome inflation or give workers a sense that their standard of living is rising. I don’t believe this is a true reflection of the state of the jobs market. Also there is almost 14% unemployment with African Americans and 25% with teens. The total number of not working, not employed, keeps rising. This should concern all Americans because it is not healthy for the country as a whole. We are falling behind still. This is the worst recovery this country has ever seen. But it is expected when you try to usher in Socialism, and promulgate the victim mentality with a perpetual road show around the country. I see and hear Democrats rant that Republicans are championing failure. But the record has consistently shown, that, IN FACT, the people championing the failure of this country are the people that lined up to put Barack Obama in for another 4 years. It’s an absolute shame!!! RIP America!! 89,304,000 NOT WORKING. As always, the numbers are manipulated by glorious marxist leader obama administration. Some people thought the world was ending. Sequesters you know. A good surprise is always welcomed. We should still remember to take these numbers with a grain of salt. Although new jobs increased by 236,000 there the overall workforce dropped by 130,000. Remember also that “new jobs” includes all part time and temporary hiring.That being said, this is certifiably good news that seem to indicate a positive trend. Yes, and 130,000 fell off the unemployment rolls having exhausted benefits. I got this from a web source and it may not be factually correct but it is worth exploring and having a debate. If this is true, then we are going backwards way fast and something constructive needs to be done to provide jobs for everyone. Meanwhile, here in Flagler County…….. The recovery is not what it could have been, but given the hard work that the Tea Baggers have done, it’s amazing that we have any recovery at all. The one good things that anyone with an ounce of common sense has to admit is that at least we stemmed the tide of losing 750,000 per moth under Bush. If the obstructionists has spent half of their effort in trying to improve things rather than destroying everything we would be much farther along. The Republican and Tea Baggers have failed at their vile attempt to destroy the USA. Why don’t we slash in half the pays of all these tea baggers/conservative legislators in the states and in DC and strip them form Health Care Insurance and vacation/bonus/pensions like they are doing to all of us while we are forced to fund their perks? They need to bite the dust as well…what kind of deal is this fascist one about all for them in power and zero and missery to us? having set his alarm clock (MADE IN JAPAN) for 6 am. to continued his search for a good paying AMERICAN JOB. a good paying job in AMERICA.